Is Your Employer Brand True? Having your employees share your content on their social media networks is the perfect way to increase your organic reach. But what type of content are your employees likely to share? Organic reach for businesses on Facebook has decreased dramatically in the past few years. Consumers might continue to follow brands on social media, but they are more likely to trust real people. 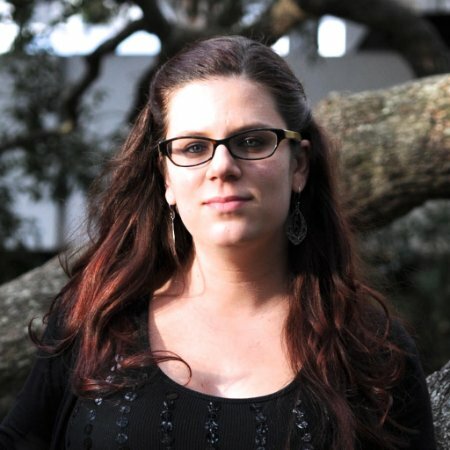 Previously, we've talked about how companies can create content employees want to share. Today, we take a deeper look at the type of content employees want to share. What Are the Benefits of Employees Sharing Your Brand Content? Content shared by employees is seen as more authentic than content shared directly from your official brand handle. Plus employees likely have a much larger and more diverse reach than your brand. Employees can drastically increase the reach of your content on social media. In fact, there is a good chance they are already sharing your content. A study by Weber Shandwick found that 50 percent of employees share content about their employers on social media, and 33 percent do so without any encouragement at all. The challenge companies face is how to embrace this movement - and one way to do that is to create the right type of content. People like to share content about them or content that shows them in a good light. 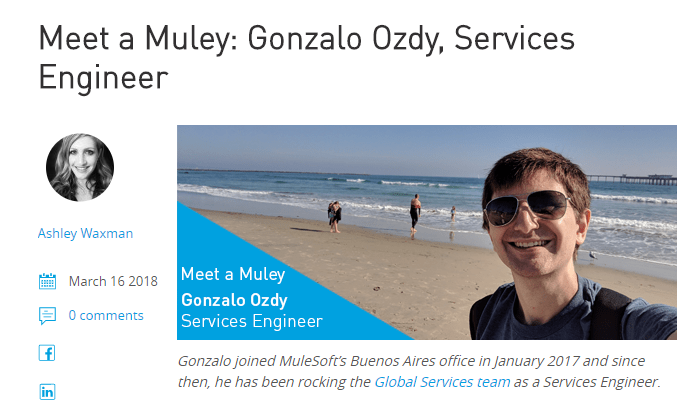 Software company MuleSoft does this well by regularly publishing profiles of their employees, like this profile of one of their services engineers. In addition to being the type of content employees like to share, this type of content also helps to humanize your brand, making you more relatable and likeable. People enjoy feeling they are part of a community, and your employees are no different. When you ask employees to get involved in the creation of your content, it gives them ownership and a sense of pride over the finished product. This, in turn, makes them more likely to share the final product. A Finnish company ZEF created a video where their "Customer Happiness Expert" interviewed a career consultant regarding emotions in the workplace. Then there's the "Made the Johnsonville Way" initiative, where employees shared their ideas for a Johnsonville Sausage ad. Both of these companies involved their employees in the content creation process, which makes them more likely to share the content on their own social media pages in a natural way. Employees share content on their social media account because they like how it reflects upon them. Content that makes them feel proud of their company, or even makes their friends a little jealous, is far more likely to get shared. Take for example, Finnish company DNA wrote about an award they were given to by The Federation of Families for being the most family-friendly company. 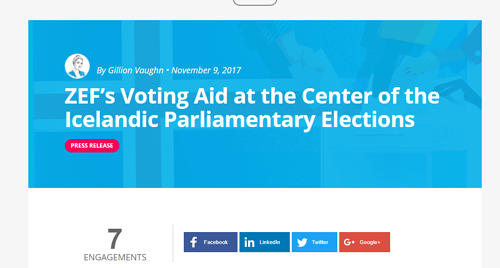 Or ZEF, whose tool was used to help educate Icelandic voters about their options in upcoming elections. Open up your Facebook or Instagram newsfeed and you are likely to see your friends sharing pictures of their dinner at a new Pho restaurant, a St. Patrick's day party they attended, their kids at the zoo, or their vacation to New Zealand. What do all these examples have in common? They document experiences. We like to share proof of experiences we enjoyed. For brands, this might include content like photo booth shots from a recent conference or pictures from the company holiday party. BBDO, an advertising company based in Belgium, does this well by sharing images of their company's yearly holiday party. 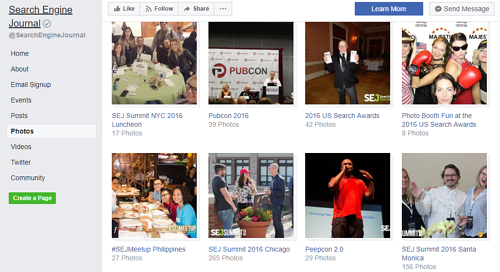 Search Engine Journal, a digital marketing publication, shares pictures from meetups, parties, and conferences. Other examples might include recap posts about conference sessions, videos from an industry event, or behind the scenes pictures from your office. Your employees can be powerful advocates for your brand on social media. In order to keep their interactions authentic, you need to produce content they want to share and make it simple for them to share that content with their networks.